Whilst recently holidaying in Bristol in the UK I was amazed at the abundance and variety of ferns growing on the stone walls around the city. 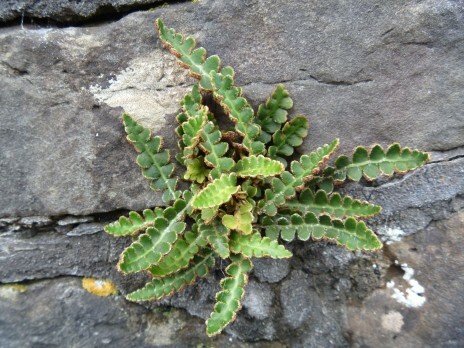 The spleenwort or Asplenium ferns seem to be the most common ferns of this habitat. 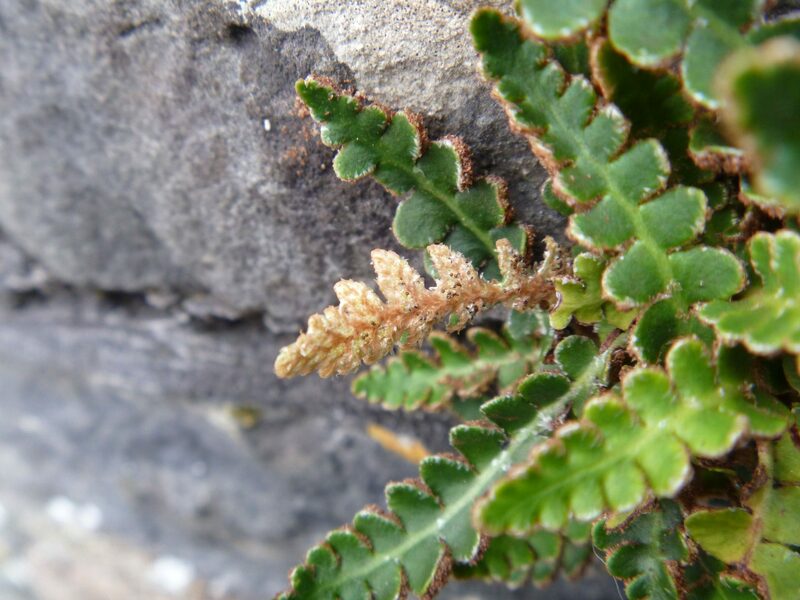 This genus also occurs in New Zealand and includes our hen and chickens fern. 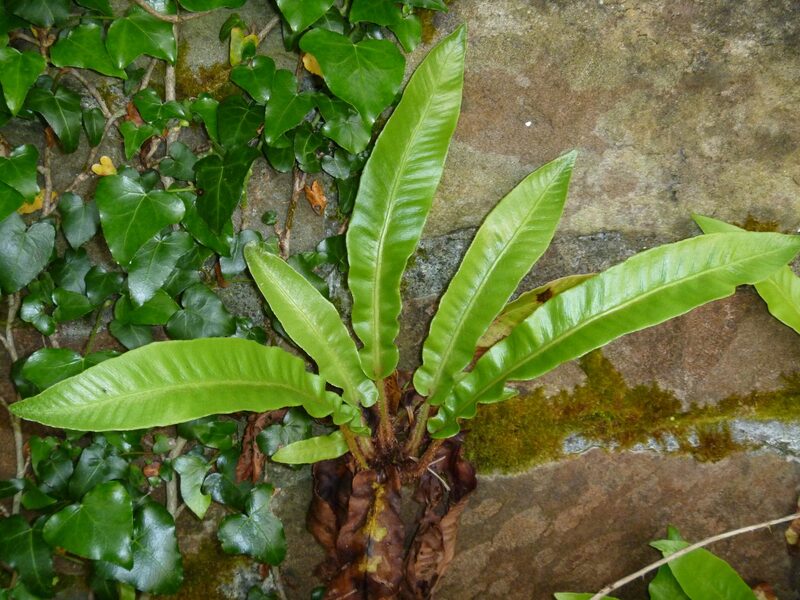 One of the most striking spleenworts is Asplenium scolopendrium, commonly known as the hart’s tongue fern. Hart’s tongue fern reminded me of the bird nest ferns of the tropics, although they are only distant relatives. 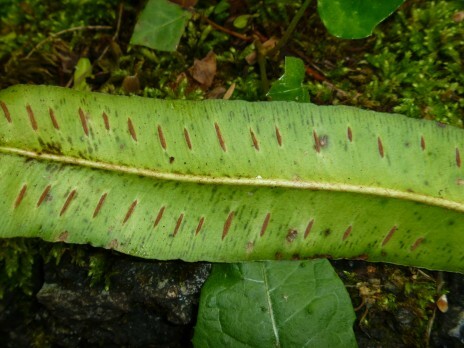 Hart’s tongue fern (Asplenium scolopendrium). Photo credit: Lara Shepherd. The common name of this species derives from the shape of the simple, undivided fronds that apparently resemble the tongue of a deer (hart is an old name for stag). The scientific name is also interesting: ‘scolopendrium’ derives from the Greek word for centipede. The pattern of the spore-bearing reproductive structures (sori) in this species is said to resemble centipede legs. 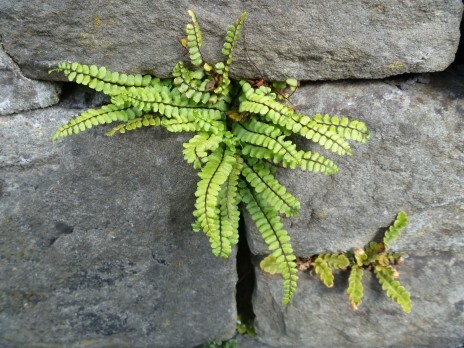 Another spleenwort of stone walls is Asplenium ceterach. This species was very easy to identify by the abundant orange-brown hairs on the underside of the fronds. It is these distinctive hairs that have led to its common name ‘rustyback’. Underside of a rustyback frond showing the orange-brown hairs that give this fern its name. Photo credit: Lara Shepherd. Wall rue (Asplenium ruta-muraria) was abundant. 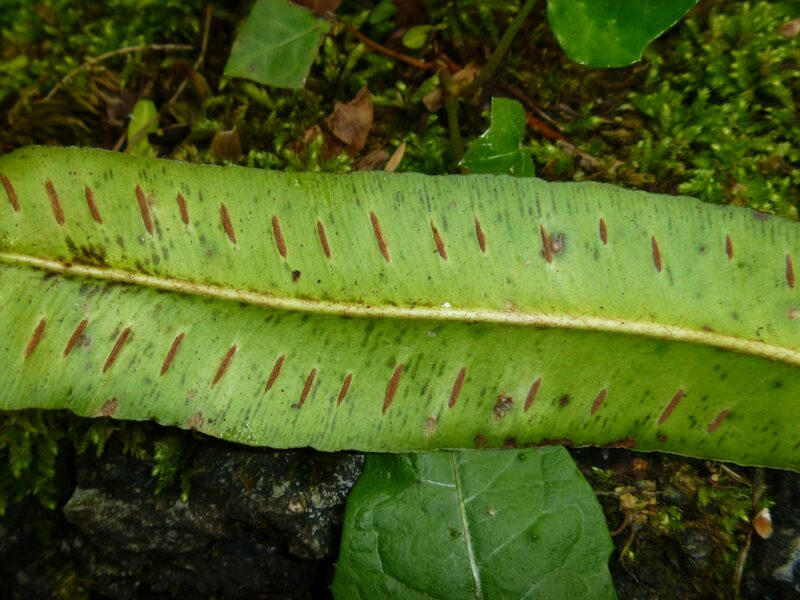 The shape of the frond segments was variable, with some forms reminding me of New Zealand’s blanket fern (Pleurosorus rutifolius) but without the hairs. Asplenium trichomanes or maidenhair spleenwort was also present. This species has an almost global distribution, including New Zealand. Maidenhair spleenwort (Asplenium trichomanes), with a small rustyback on the lower right. Photo credit: Lara Shepherd. The final fern on walls I saw (but only occasionally) was the common polypody Polypodium vulgare. 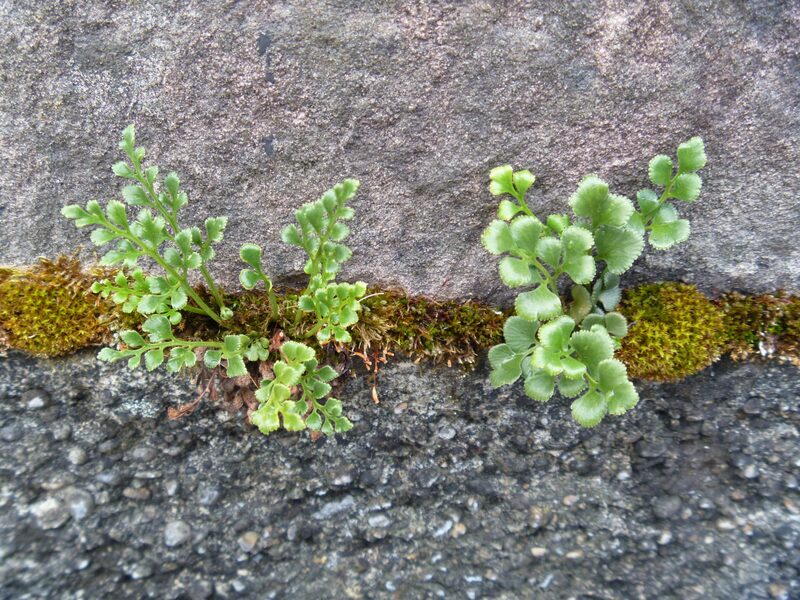 This species has become naturalized in New Zealand and appears to be spreading. 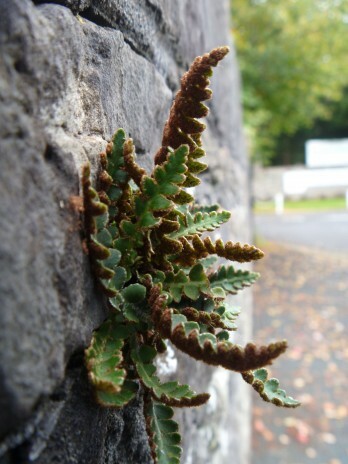 Common polypody (Polypodium vulgare). Photo credit: Lara Shepherd. 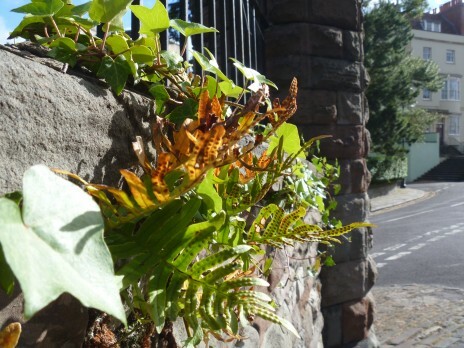 I was wondering where exactly you found these ferns as I am currently studying the fern species growing in Bristol and the samples you have shown are very interesting.